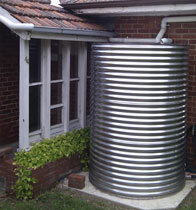 Stainless steel is a long-lasting material and a good choice if you are after high-quality water. The cost of stainless steel tanks has come down considerably in recent years with more manufacturers creating greater competition. These days, stainless steel tanks can be bought for not much more than many Aquaplate and Colourbond tanks and given their long life span may well be the most economic long-term solution. Stainless steel tanks are extremely durable and will most likely outlast all other tanks. They are relatively easy to repair using a stainless steel fabricator to weld small holes and patch larger ones with new stainless steel. The repairs generally need no additional treatment (i.e. coating) as the corrosion resistance is in the steel itself. Depending on the damage, they can also be repaired with various waterproof sealants. Stainless steel tanks come in many shapes and sizes and like Colourbond tanks can be custom made to suit a wide variety of applications. Stainless steel is a relatively inert material and will not adversely affect water quality or taste. Stainless steel tanks generally don't corrode to the same degree as coated steel tanks and the material itself is quite valuable and can therefore be sold as scrap metal at the end of its life. As all of the material in stainless steel tanks can be recycled it is likely to avoid landfill altogether. Stainless steel does come with a high embodied energy, though the long-term environmental impact is reduced somewhat by its recyclability and longevity. Very happy with stainless steel. The best without doubt! The tank is good. I used an angle grinder near the tank and the sparks caused minor rust stains in one area. I've been told this could lead to troubles in time.